It appears the small Gulf state of Qatar is interested in testing and possibly purchasing the brand new Infantry Fighting Vehicle Lynx KF41 designed and produced by Rheinmetall, which is one of the vehicles considered by the Czech Ministry of Defence to replace the againg BVP-2 (BMP-2). On 18th December Qatar commemorated its unification in 1878, the Qatar National Day. 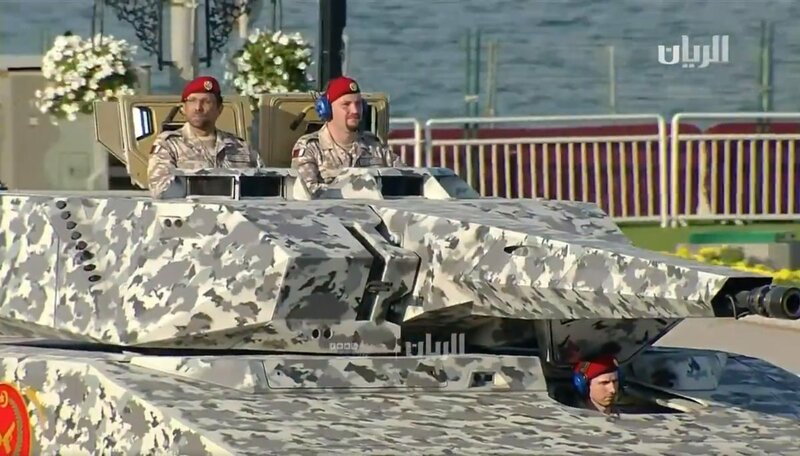 The program of celebration included also a military parade, during which the IFV Lynx could have been seen with Qatar armed forces camouflage. Qatar's army can field 8,500 servicemen. With slightly over 2.5 million inhbitants the country's army is relatively of comparable size to the Army of Czech republic. Its armored brigade is armed with Leopards 2A7 which currently replace the AMX-30s, and with the MOWAG Piranha wheeled armoured fighting vehicles. Untill now it lacked a tracked infantry fighting vehicle, and the photos taken during the parade which show the Lynx could be a sign of change. Why is it interesting to us in the Czech republic? Obviously, as we try to gather as many information on the four competitors as possible (Lynx, Puma, ASCOD 2, CV90), one of the general questions concerning any purchase of military equipment is : who else does operate it. What are the experiences. Lynx is brand new; it has not seen service and much less combat yet. Is it a disadvantage? The answer depends on how the army actually percieves the project. A huge tender at CZK 53 billion (USD 2.6 billion) should bring new Infantry Fighting Vehicles for the Czech mechanized battalions for at least 30 years; in reality, as we see it all around, it might be much longer. Now will the army prefer experience over potential advantages brought by the new conceptions? It certainly is possible to upgrade an existing vehicle with better armor, propulsion, tracks, weapons, hi-tec devices and give it actual combat capabilities; but somehow one feels today’s technology might fit better in today’s design. What appears to be a disadvantage when compared to a proven vehicle may easily turn to be the most important advantage after all. It appears Qatar may have chosen its way. 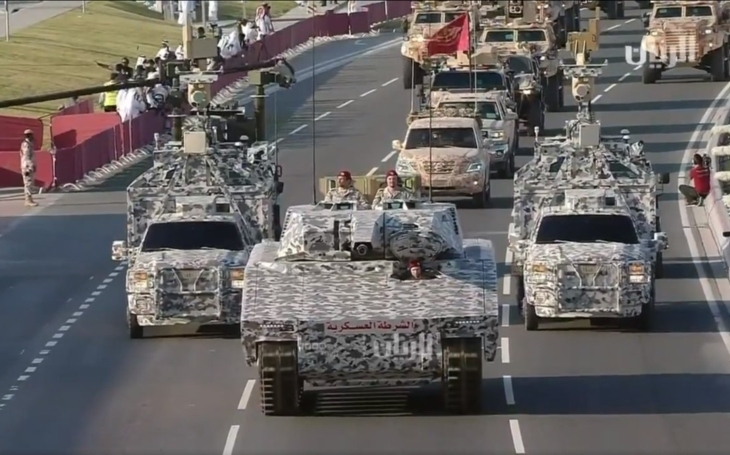 This parade at the occasion of the Qatar National Day is another move in a series udertaken by Rheinmetall to promote the Lynx, a series which included the Lynx IFV’s journey to Australia earlier this year (the Australian army will get Boxer wheeled vehicles by Rheinmetall, and Lynx is considered to be the favourite of its large tracked IFV tender too), or its presentation during the NATO Days in Ostrava, and the presence of Rheinmetall at the Future Forces Forum in October. And Rheinmetall Defence has teamed with Raytheon to meet the U.S. Army’s requirement for a next-generation combat vehicle: Lynx is being offered to the U.S. Army as a potential replacement for the iconic M2 and M3 Bradley. All four competitors who take part at the Czech tender for BVP-2 replacement offer capable vehicles and interesting solutions. Rheinmetall is very active in promoting the Lynx, and the world armed forces are listening, and answering. In our article Czech Army’s Modernization Projects: the IFVs you can find the basic requirements the Czech Army has issued for its new Infantry Fighting Vehicle.